You have worked hard to finish your beautiful quilt top -- now what!! This class is exactly what you need to get started in learning how to quilt your own quilt tops - no matter what size they are. 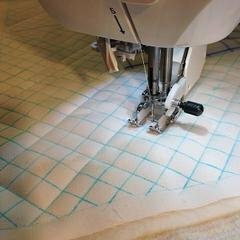 In this class you will learn how to prep your quilt top, different options for basting your top, how to manage quilting a large quilt using a domestic machine, different methods for marking your quilt top and much more. You will also learn many creative ways to quilt with your walking foot. This class is for beginning quilters and beyond who want to learn the fundamentals of quilting any size quilt using your own machine and walking foot. Please note: This is the first of two classes for Machine Quilting. This class is a PREREQUISITE to taking the second class in this series, Free Motion Quilting. You will need to bring your own sewing machine along with your own WALKING FOOT. There are also several other supplies REQUIRED for this class. Please review the SUPPLY LIST below for this class and/or stop in at Quilter’s Haven to have one printed out for you. All supplies must be ready PRIOR to class. We will be spending the majority of our sewing time learning multiple ways to creatively use our walking foot for quilting. Purchase a minimum of approximately 2 yards of fabric. You will need to cut this into 24 squares – each measuring 10 – 12 inches. PLEASE HAVE THESE CUT PRIOR TO CLASS AND HAVE THEM PRESSED AND READY TO GO. Feel free to bring extra fabric squares so you can practice more quilting. You can buy a package of Crib Size batting or you can buy batting by the yard at Quilter’s Haven. Please buy 100% cotton or 80/20 cotton batting (low loft). You will need to cut this into 12 squares – each measuring approximately 10 – 12 inches. PLEASE HAVE THIS CUT PRIOR TO CLASS. Feel free to bring extra squares to practice with (you will need one square of batting for every 2 fabric squares).